Offering live streaming for sporting events is certainly not new, but the way that ESPN has integrated their streaming with cable providers has been excellent. 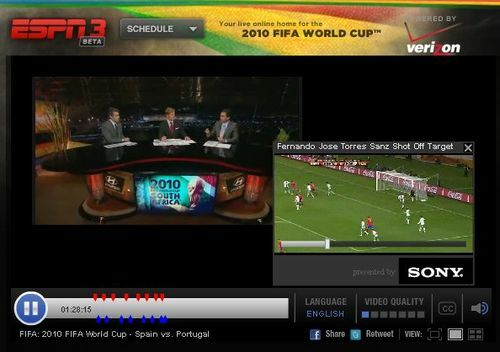 For many soccer fans, watching the World Cup Live might have been their first experience at a “pay for streaming” service online. Hulu is paid for by ads, and YouTube is omnipresent – but ESPN3 took the riskier step of integrating with cable providers. 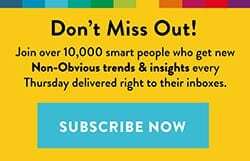 By doing so, they not only managed to prove their value to their cable provider partners/subscribers – they also managed to create a great user experience because they didn’t force consumers to pay again for something they were already paying for through their home cable subscription. Big win for ESPN. Coke is an official sponsor of the World Cup and has the stadiums plastered with their logo as you would expect. Continuing with their theme of happiness that was so nicely brought to life through viral videos such as “The Happiness Machine,”, their World Cup spot focuses on the story of Roger Milla and his dance of celebration during the 1990 World Cup that sparked a revolution in goal celebrations (as the ad claims). The video is set to the official theme song of the FIFA World Cup 2010 and the voice over is from an announcer with a South African accent (nice touch). The last shot of Roger Milla in the stands enjoying a Coke while the voiceover talks about how he “showed the world how to live” is pure World Cup melodramatic magic. As the official automobile sponsor for the World Cup, KIA had fertile ground to do a lot of great things around the World Cup. Unfortunately, their actual effort seemed uncoordinated and confusing – with KIA Motors South Africa running a promotion all about offering an exclusive experience to people who engaged with the South African page or Twitter account, while the global marketing team seemed to focus on the new Soul car with a 1 minute video (embedded below) asking “what’s your soul app?” and randomly talking about anti-gravity apps. The US KIA Twitter page doesn’t even mention anything about the World Cup, the global Facebook page offers disconnected polls and the pieces of this campaign just seem out of sync in the unique way that can easily happen when global teams work in their silos and never collaborate. One commenter on their YouTube video summed it up best in their response to KIA’s question … “My soul app is the one that blocks these kind of ads.” Ouch. Continuing their Human Network campaign* Cisco uses an engaging ad showing a soccer juggling trick they call the “around the world” that spreads from country to country through young soccer fans watching a video and trying to recreate that moment. As a kid, I remember watching JÃ¼rgen Klinsmann in 1994 score an amazing goal against South Koreans and spending months practicing and trying to perfect the same move. 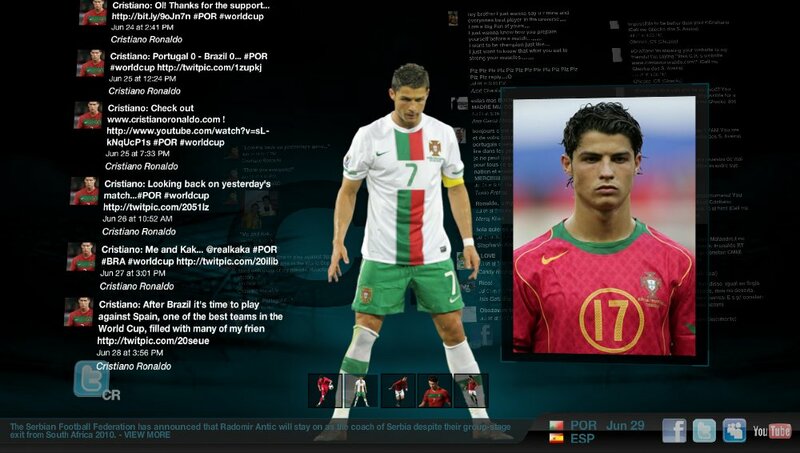 Cisco managed to tap that moment that many soccer players and fans could relate to, and demonstrate how their global network makes sharing moments like that possible in a faster and more real way than ever before. (*Full Disclosure – Cisco is an Ogilvy client, but I did not work on this campaign). 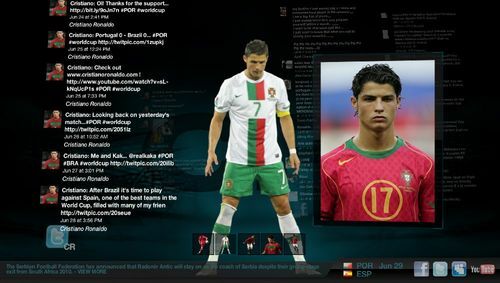 al Spain, Ronaldo was featured heavily in the news for his comments about feeling like a “broken man.” Unfortunately, he isn’t sharing this despair in any sort of dialogue with his fans and his Twitter feed has been silent since before the Spain match. The lesson it brings to light is the central pitfall in creating this “revolutionary” new model for dialogue between a celebrity superstar and his fans: the whole thing falls apart if the superstar just doesn’t feel like talking. 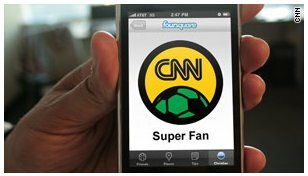 CNN jumped into the geolocation bandwagon around the World Cup and launched a promotion with Foursquare where they are offering special badges to people who check in at locations within South Africa as well as at viewing parties at various locations around the world. Though they are not broadcasting the games, this is an interesting chance at experimentation for the brand and if it works I imagine we will begin to see this used by other Turner Network channels like TNT around college basketball, as well as potentially around large newsmaking events that draw a crowd at viewing parties as well, such as national elections. You have to give Budweiser credit for not giving up on the BudTV idea even though their idea of a 24 hour online network fell flat. 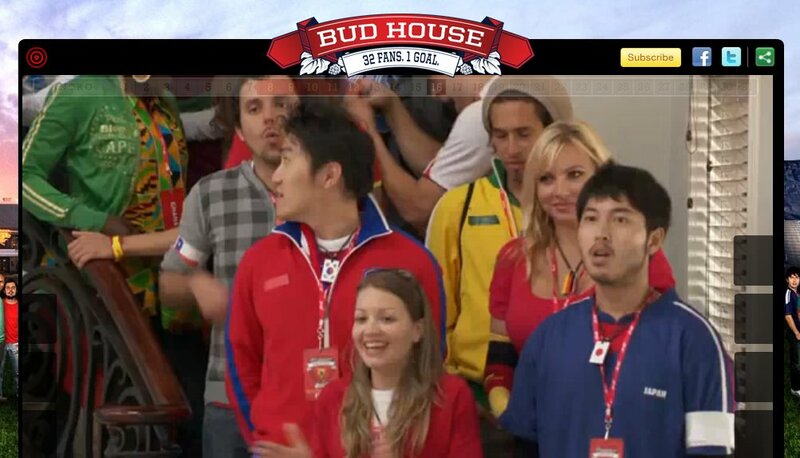 Around the FIFA World Cup, they leveraged their sponsorship to create the Bud United house where they invite one person from every one of the 32 finalist teams to live in a house together during the World Cup. 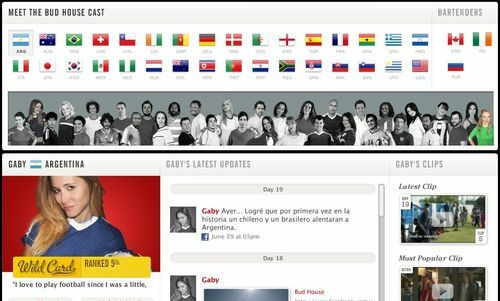 The only rules were that when your team was eliminated from the World Cup, you were too. The result is an engaging online reality show that has a great premise, interesting content and a unique sponsorship activation. The only problem to see with this campaign is that they focused all their TV budget on running the same ad over and over where the fans try to distract the soccer player with an mosaic image of beer in the stands. If they used some of that budget to drive TV audiences to check out Bud United, they would have likely increased their engagement dramatically. Pepsi was one of the sponsors that some felt “ambushed” the games to take away attention from the official soft drink sponsor (Coke) and got great buzz for their TV spot and viral video featuring people making a soccer pitch for several soccer superstars to play against kids in a soccer challenge. The not so subtle message is that Africa can achieve great things (like defeat international soccer stars) if her people can work together. Nike’s online long form ad with the tagline of “Write The Future” can only be described as epic in how it manages to take all the top tier talent they sponsor and roll out a story that not only talks of their impact on the game and culture, but how what happens on the World Cup stage often does write the future for all of us. The World Cup is special in its significance to the world and watching this ad helps you understand and live that. If there is one ad most closely associated with this World Cup, it has to be the Write the Future campaign. Adidas still had a strong global showing and for “real soccer players,” Adidas remains the brand most focused on soccer and stands to realize big revenue gains from merchandising as a result of the games. They made the uniforms and the often debated . But for Nike to grab just a bit of the spotlight through great creative and storytelling isn’t bad for a brand that was not the official sponsor. 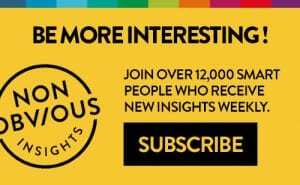 After the games finish and the world turns its attention to the next big sporting event, the biggest winner from these games may very well be Brand South Africa. 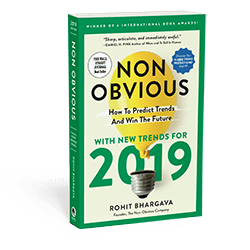 The country has had an ambitious nation branding and marketing effort in place since 2002 – and one that in part led to their selection as the host nation for Africa’s first FIFA World Cup. The games have gone off perfectly and the biggest controversies to date have been the Jabulani ball and the inconsistent officiating – both having little to do with the host country. 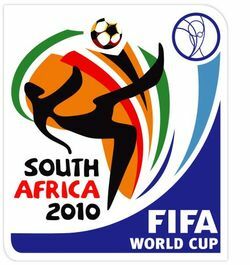 Using music and dance as a way into their culture, coverage of the games online and on television were filled with African rhythms and clearly stood out from anything else. Though the South African’s didn’t progress in the tournament as far as they liked, the country invited the world to their doorstep, brought out the vuvuzelas, did a disika dance and showed the world what Africa was truly capable of. Amongst a World Cup filled with good and bad marketing lessons, South Africa deserves to stand at the top of the list with pride. Good marketing helped them get selected to host the games, and great marketing will help them inspire people to visit and invest in their country long after the final match is played and a champion is crowned.